Shillong, April 11: Voting for the first phase of Lok Sabha Elections 2019 is taking place in two constituencies of Shillong and Tura today. Polling began for Shillong and Tura Parliamentary seats on Thursday, April 11, at 7 am. Security has been tightened in both the constituencies that went to polls today. A total of 19,14,795 voters are expected to cast their votes in the first phase in these two constituencies in Shillong and Tura. The state also has 2144 service voters in Shillong and 1280 service voters in Tura for the first phase. 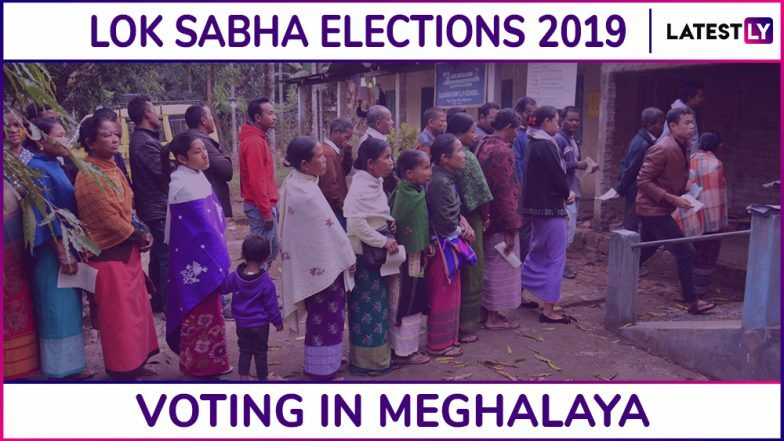 Meghalaya Lok Sabha Elections 2019 Schedule: Complete Dates of Voting And Results For General Elections. The polling percentage recorded in Meghalaya Till 5 pm was 62%. Voting will be held across 1114 polling booths spread across these two constituencies. Voting is taking place through Electronic Voting Machines and VVPAT machines have also been placed at every polling booth. Here's how you can check your vote on VVPAT. Shillong Lok Sabha Constituency in Meghalaya: Candidates, Current MP, Polling Date And Election Results 2019. A total of 4 candidates will battle in these two constituencies. In Shillong, the key candidates are Shri Sanbor Shullai of Bhartiya Janata Party and Vincent H Pala of the Indian National Congress. In Tura, the key candidates include Shri Rikman G Momim of the BJP and Dr Mukul M Sangma of Indian National Congress. Tura Lok Sabha Constituency in Meghalaya: Candidates, Current MP, Polling Date And Election Results 2019. General Elections 2019 will take place throughout India in seven phases. While the first phase of voting is being held today, the last phase of voting will take place on May 19. In Meghalaya, voting for both the constituency will take place in the first phase only. The result of the first phase will be declared on May 23.